Steam Coils – Industrial Heat Transfer, Inc. Steam coils are typically manufactured from reliable materials such as stainless steel, brass, and aluminum. These metals are reliable in a wide range of temperatures and can handle high pressures. These coils are most commonly used in HVAC systems, particularly for heating applications. For most applications, a boiler is used to heat water and cause it to turn into steam. The steam then travels through a system of tubes to the steam coil, where the steam can transfer its heat to the air around it. The coil construction of these systems provides a greater area for heat transfer, thus making it a more efficient heating method. As the steam travels through the coils and releases its heat, it loses energy and is cooled and condenses back into water. The water is recycled back to the boiler where it is reheated and changed into steam again. This process is repeated over and over to provide consistent heating. It is common for many industries to incorporate this kind of heat transfer solution in their processes. Examples of industries who utilize these types of devices include: aerospace, automotive, pharmaceutical, food processing, water treatment, metal manufacturing, marine, petrochemical and much more. Steam Coils Steam coils are a type of coil that utilizes steam to transfer heat to a particular area. 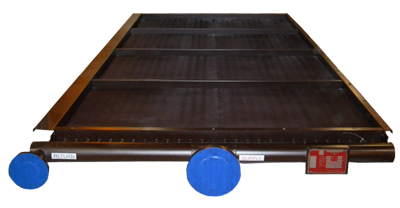 Since steam is relatively easy and inexpensive to move from one point to another, many industries prefer this style of heat exchanger. In addition, when it condenses, steam releases most of its energy at a constant temperature, and it is simple and quick to control steam processes.